The 5 Best Fly-Fishing Spots in Iowa! For the anglers that reside in Iowa, it’s probably not uncommon knowledge that the many streams, creeks, and waterways throughout the state are stocked with trout on a weekly basis. Many of these fish can provide a fun-filled afternoon of casting a line and choosing the correct lure. While there is a plethora of fly-fishing spots in Iowa, a few locales exceed the others, and it isn’t about the amount of fish you can catch at these five best fly-fishing spots in Iowa—it’s about the beautiful scenery that surrounds them, making for a fulfilling fishing experience even if you fail to catch anything at all. Located two miles west of Marquette, Bloody Run Creek offers over six miles of stream to cast a line into, and a wide variety of fish to pull out of the water. Bloody Run Creek is stocked weekly from April to October, and regular catches include brook, brown and rainbow trout. Whatever lure you decide to try at Bloody Run Creek, with campsites located nearby, you have plenty of availability to experiment with your lines. A popular place for Iowans and beyond to fish, parts of Bloody Run Creek are found on private property, giving extra importance to following park signs and settling in only at designated areas. For some scenic surroundings to fish in, Coldwater Creek near Bluffton provides a fun-filled day even if you don’t catch anything. Though, with weekly stockings and an abundance of brook, brown, and rainbow trout, most people tend to reel something in after casting a line or two into Coldwater Creek. Throughout the four miles of water that consist of Coldwater Creek, you can expect to find other visitors there including an abundance of wildlife. Whether you are a serious angler looking to make the next big catch, or just a casual weekend-goer looking for somewhere with good views, Coldwater Creek is just the place for you. Not far from the Mississippi River and city of Dubuque, the Lower Swiss Valley Creek offers an angler's dream come true. Not only is the Lower Swiss Valley Creek a little slice of Iowa scenery worthy of a postcard, but with weekly stockings throughout the warmer months, there is ample opportunity to catch your dinner when visiting. Lower Swiss Valley Creek also offers a playground, picnic area and camping nearby, making this top fly-fishing destination fun for the whole family. Spend the day, weekend or entire summer at Lower Swiss Valley Creek, and you’re bound to catch something worth bragging about. Branching off the Maquoketa River not far from the city of Manchester, Baileys Ford is one of the most popular trout fisheries in the state of Iowa. It’s not just the weekly stocking of rainbow and brook trout that make this waterway such a great place to visit, but it’s the surrounding woodlands of the Baileys Ford County Park that draws in big numbers of visitors throughout the year. With the right lures and a little bit of patience, anglers can expect to pull out wild brown trout as well. 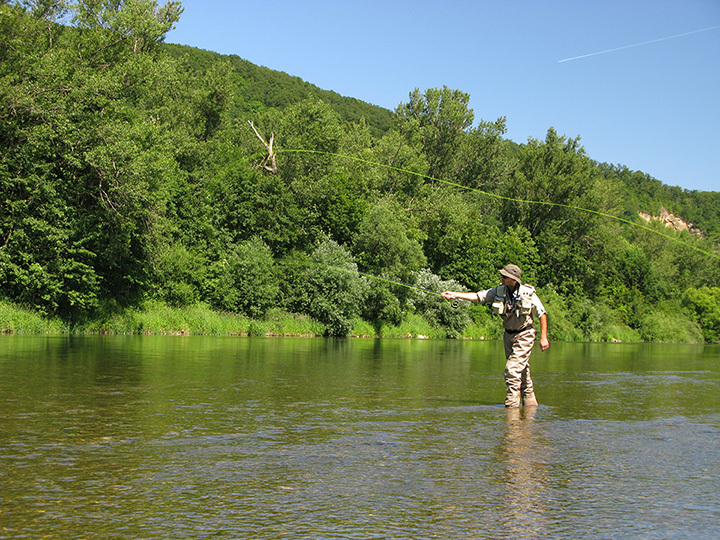 With non-electric campsite available at Baileys Ford, a multi-day fishing trip is easily accomplished at this popular Iowa fly-fishing destination. The Yellow River State Forest of northeast Iowa contains the densest collection of adventure opportunity in Iowa, and between the backpacking trails and scenic bluffs, some amazing fly-fishing opportunities are waiting to be explored as well. A great spot for fishing in Yellow River State Forest can be found in Little Paint Creek, which features three miles of water stocked weekly with rainbow and brook trout, plus the occasional wild brown that likes to swim by the shore. Featuring an accessible pier to cast a line from, the most popular option for Little Paint Creek is to simply fish from the shore. With the serene Iowa surroundings serving as a backdrop to the whole area, even if you come up empty handed at Little Paint Creek, you won’t leave feeling like you missed out on anything. View more Iowa Fishing Holes.